Islands have a pull on the imagination, cast adrift from the mainland, floating free, with their own special atmosphere and pristine quality; buffeted by winds and untainted by the smells, noises and pollutants of modern urban life, the air feels fresher, the night sky clearer, and there is a deep silence to be found. They are places of romance and magical fantasy (The Tempest), dreams of paradise (Huxley’s Island) or sometimes dystopian horror (The Wicca Man, The Beach). England has around 120 islands dotted around (a mere handful compared with over 790 Scottish islands) and on a family holiday in North Devon I’m eager to visit one I’ve long wanted to see, Lundy, located 12 miles off the coast and reached by a two hour boat ride from the harbour at Bideford, which feels like a real adventure in itself. At half past seven on a chilly morning we board the MS Oldenburg, a 60 year old vessel once used to ferry passengers between the German mainland and the Frisian Islands in the North Sea, transferred to service on Lundy in 1985. While the rest of the family head into the warm fug below decks, lured by the promise of cappuccino and bacon butties, I head up top. As soon as I embark on any boat trip I tend to come over all maritime, humming a sea shanty, strolling about the poop deck and generally behaving like a salty old sea dog. I’m not wearing a cap today but, if I was, there’s little doubt it would be cocked at a jaunty angle. It’s a dull day so we don’t get our first glimpse of Lundy until we’re fairly close, which adds to the sense of drama as the high granite cliffs and lush green fields loom through the thick clouds. Lundy’s main attraction is its remote tranquillity, cut off from the modern world, but it also boasts a 13th century castle, a disused lighthouse, a village pub and a unique species of cabbage found nowhere else in the world, imaginatively known as the Lundy Cabbage. The island has had a colourful history, including being invaded by Barbary Corsair pirates from the Republic of Salé (now part of Morocco) in the 1600s. The Corsairs remained in occupation for five years, flying the Ottoman flag over the island and holding a number of prisoners who were later shipped off to Algiers to be sold into slavery. I’m a sucker for anything piratical, the more bloodthirsty the better, and the Barbary Corsairs are up there with the best of them. (Although my favourite pirate of all time would have to be Black Bart Roberts, a devoutly religious man who would happily slaughter and maim everyone in sight Monday to Saturday but would never spill a drop of blood on the Sabbath. Except maybe the odd bit of light maiming, every other Sunday, just to keep his hand in). I’m not sure the Lundy coast-to-coast is ever going to feature as a major event in the UK cycling calendar as the island is just three miles long and three quarters of a mile wide at its broadest point. Still, it makes for a very decent hike up one side and back down the other, with steep craggy cliffs, a profound, slightly eerie sense of calm, the Bristol Channel on one side and the vast blue-green of the Atlantic on the other. Considering tourism is now its main reason for being, the island is remarkably unspoilt, but that’s why people come here. It’s the absence of things that draws them: it’s car-free, Wi-Fi-free ,there are no TVs and it doesn’t have a Nando’s. As impressive as this menagerie sounds, my expectations are not high, being a veteran of slightly disappointing wildlife watching attractions over the years: boat excursions to view elusive sea creatures; zoo trips where charismatic mega fauna, known for their precocious interaction with humans, are unaccountably struck by shyness on the very day I happen to be visiting. We set off walking up the west side of the island in the direction of Dead Cow Point. After an hour my daughter, some way in front, cries out. A seal has been spotted 20 yards off the coast! We scramble up a grassy bank and no-one speaks as we watch the sleek black shape floating just below the surface of the water. Nothing happens for a very long time. We keep on watching. Eventually my wife says ‘I don’t think it’s a seal after all. I think it could be a rock.’ We agree. It is a rock, albeit one that looks uncannily seal-like. Half an hour later we arrive at Dead Cow Point. An elderly man and a small boy are perched on the edge of a cliff taking it in turns to peer through binoculars at a crag on the opposite side of the bay. They have been here a fair while it turns out and are yet to see a single puffin. In fact, there isn’t even a dead cow at Dead Cow Point. I suppose there must have been once but it was probably removed for health and safety reasons. There are plenty of other birds apart from puffins though, squawking and wheeling and darting overhead and the elderly chap takes great delight in pointing them out and naming them to his grandson. I suddenly feel inadequate because I’m not good at identifying birds, apart from the obvious ones that everyone can do like robins. I do actually know the names of lots of species though. As a child my brother had an extensive egg collection (considered a legitimate hobby in the very un-pc 1970s). I also used to spend a lot of time playing ‘things that begin with the letter A’- type games with my father (there were few other means of entertainment back then. A bit like Lundy today if fact). If I was a contestant on Pointless I’d be quids in if there was a ‘birds’ round; Capercaillie, Golden Oriole, Ptarmigan, Grebe, Widgeon… just don’t expect me to point them out to you. I wouldn’t know a Ptarmigan if one shat on my head. It’s the same with a lot of trees and flowers and butterflies. I’m quite ashamed of this ignorance. My dad knew all this stuff, so maybe it’s a generational thing or the effect of years of urban living. I suppose I’m one of those people for whom nature, in the naturalist Richard Mabey’s words, is something of a ‘generalised green blur’. I love that blur, delight in walking and cycling amongst it, and believe passionately that we should do everything we can to protect it. I just don’t know all that much about it. I resolve to do better in future though, starting with that Collins Bird Guide I bought a while back and haven’t opened yet. 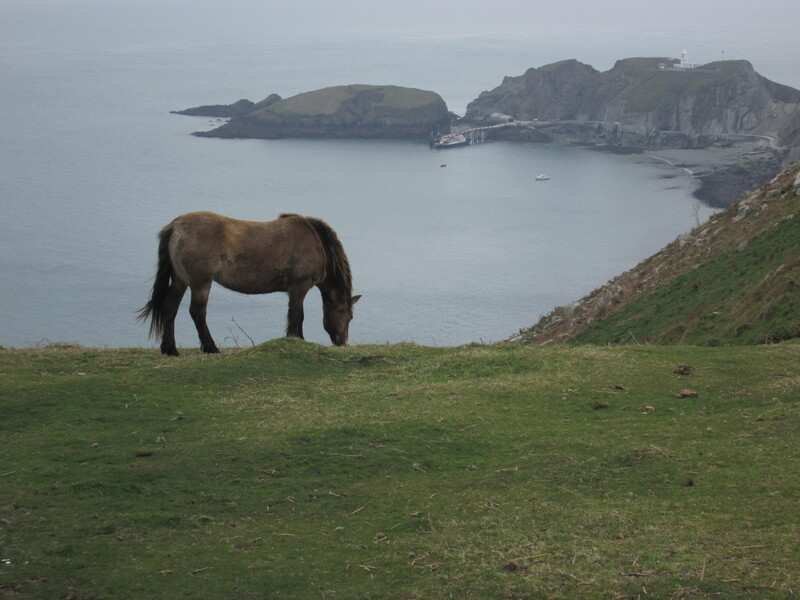 Back on the walk, we do have more success with Lundy’s land mammal population, though on a landmass totalling two and a quarter square miles even I would find it hard to miss a dozen majestic wild horses and a large herd of deer. A little further on we stumble upon the carcass of a small animal, recently killed judging by the raw neck wound and the stench of fresh blood carried on the breeze. ‘It’s a rabbit’, I pronounce confidently, although it is rather a funny looking one. ‘Oh my God, it’s a baby deer!’ says my daughter. ‘Yes, it’s a fawn!’ I say, trying to regain authority by employing a technical term. It is indeed a fawn which has paid the ultimate price for wandering 50 yards from the herd. I’m puzzled by the identity of the killer – a dog out of control? But glancing at my Lundy wildlife leaflet it dawns on me that the assassin must have swooped from the heavens in the shape of a Peregrine Falcon. That green blur can be pretty brutal sometimes. Back in Lundy’s village pub, The Marisco Tavern, there is more Bambi (casseroled) on the menu and ‘Lundy Experience’, a fine ale from Cornish brewer St Austell. Lundy has a resident population of about 30, all employed by the Landmark Trust to look after the island and its visitors. One of them, a young woman serving food, says she came once on a day trip and has been here ever since. She prefers it on ‘non-trip days’ though, when it’s much quieter, ‘not like today’, she says, gesturing with a sweep of the arm. I look around and see a family munching cake, a young couple playing scrabble and a bearded man in a cardigan. A sign behind the bar asks people to switch off all mobile devices. I came across a similar notice in a tea shop in Totnes (in fact my wife pointed it out to me as I was talking loudly into my iPhone). This seems to be a growing trend – the ‘digital detox’ space where we are encouraged to unplug ourselves from the grid for an hour or two. There’s also a clock on the wall which looks odd but I don’t know why. Then I see. It’s numbered backwards, the 9 where the 3 should be, 10 instead of 5 (and vice versa), and so on. Although the hands appear to be in the correct positions, the effect is disorienting. Perhaps this is meant to signify ‘Lundy time’, a place that obeys its own temporal laws. Or maybe it’s a cunning ploy by the Landmark Trust to make sure we miss the last boat back and have to rent out one of the island’s 23 holiday lets. We make haste to the jetty at the bottom of the cliffs. The clouds have cleared and as the boat chugs away from the little harbour and we say goodbye to so-called ‘Puffin Island’, I sit on the deck and fall asleep with the warm afternoon sun on my face. I awake to hear a man in conversation with a mother and daughter who are sporting huge pairs of binoculars and clad in matching yellow cagoules. They appear to be comparing notes on the varieties of Lundy wildlife they have spotted, but it soon becomes clear it’s a fairly one-sided contest. The woman reels off a formidable check-list, ‘skylarks, kittiwakes, puffins (yeah right), wheatears, guillemots’, she’s unstoppable now, ‘kestrels, shags, seals obviously…’. Her daughter nods earnestly. She hasn’t finished yet though. ‘But we saved the best till last…(inside, a small part of me dies)…a family of dolphins frolicking just off the rocks over on the east of the island!’ . I’m reeling frankly. I feel like shoving her off the boat. Dolphins are not even mentioned in the leaflet! For all I know this could be the first sighting of dolphins on Lundy, ever. Lundy is clearly more ecologically rich than the Amazon Basin. How can we have managed not to see any of this? I have failed as a parent. Thinking dark thoughts, I wander to the back of the boat (which we nautical types call the stern). As the island becomes a faint speck on the horizon I find myself wondering if this is the last time I’ll ever come to Lundy. More and more these days, I find myself thinking such thoughts – rather melancholy, I know, but their poignancy also seems to heighten the experience of things. As Martin Amis said, as you get older things become ‘imbued with a kind of leave-taking resonance, that it’s not going to be around very long this world…so it begins to look slightly magical again’. Years ago I visited the island of Iona off the west coast of Scotland, a wonderfully mist-wrapped, atmospheric place. As we were leaving, the guide on the boat told us that, according to ancient Scottish legend, ‘If you see Iona once, you will see it twice’. This prophesy has yet to be fulfilled but I like the idea of some ineluctable force calling me back. Although on reflection it does sound like another ploy by the local tourism board to drum up repeat business. So maybe I’ll return to Lundy one day too. I’m not sure though. I feel like I’ve done Lundy. Apart from the sodding puffins.